Now that we’ve talked about what fits together, we can talk about which new components you should buy! This shopping list describes the essentials and why you’d need them, including CPU, motherboard, ram cards, video cards, the power supply, a hard drive or two, a cooler for the new components, a case to hold it all in, and maybe some extras if you need them(and if your wallet allows!). The CPU is the brain of the computer. With all this talk of cores and threads and families and GHz and TDP, what’s the real difference from one chip to the next? What do I look for? What are the “good numbers?” Well to start, as we mentioned in our last article, there are only two different manufacturers of CPUs; AMD and Intel. As far as performance goes, the difference between the two brands is nearly indistinguishable across all comparable tiers, and prices change all the time. Though you should keep in mind, it’s entirely possible to spend upwards $300 on this one tiny chip alone, so you do want to pick carefully. Looking back to our first article in the series, we must revisit our initial intention: what I’m using the computer for, again? If it’s just basic tasks like surfing the internet or keeping pictures or word documents, you don’t need anything extreme as far as new components go. You’ll be hovering around 2-4 cores and a minimal speed; somewhere around 2-3GHz. TDP (Thermal Design Power) is irrelevant at this tier; you won’t need to take any serious consideration into the average temperature of your CPU as you aren’t overclocking. If you wanted to get something a little bigger for, say, gaming or heavy program use, you’d most likely be looking at a chip valued at $200-$300. These would have 4-8 cores and run 3-4GHz. Noticing a number trend? It has all the power a basic to mid-level gamer needs, because most of the gaming power comes from the graphics card. If this doesn’t quench your thirst for power, you might find yourself spending $300-$400. You’d use this for things like video editing or 3d rendering or massive computations that tax your cores and threads. This is a true workhorse machine; something with 8-16 cores that runs at 4GHz+. This chip is a real powerhouse, and where TDP comes in to play for you overclockers out there. TDP is the maximum operating temp for your CPU, and our goal is to make sure it never meets that point. That said, you’d do well to get a high-quality cooler to go along with your high quality or overclocked chip. By now, you’ve probably gotten the gist of the concept of cores; the more the merrier. What about threads, you might ask? How are they related? In short, Cores are the physical hardware that works on the data, whereas Threads are the small sequence of programmed instructions. Usually, a processor’s cores can only work on one thread at a time. If your chip has Multithreading capabilities, you may be able to speed this up manually. This isn’t an overclocking article, but I’ll give you a hint: everything you need to change to overclock your CPU is typically in your BIOS. The BIOS resides within our next component, Motherboards. Motherboards are what tie it all together and are arguably the most important of your new components. The evolution of Motherboards is a long one, with many design bumps and ditches in the road. From PCI slot evolution, to the slow but steady elimination of Northbridge and Southbridge, many things have shaped the way motherboards are today. In our last article, we discussed that it’s important that you check sockets while making this decision and buy your CPU and your Motherboard together. Only so many motherboards are compatible with certain chips. As always, consider what you’re using it for. Something with a max ram capacity of 16Gb will do just fine for low tier builds, while mid-range to larger builds would require something like a 32Gb max. If you absolutely need the ram, it’s certainly possible to get something with a max capacity of 64Gb, but 64Gb of ram is considered overkill for almost everyone. 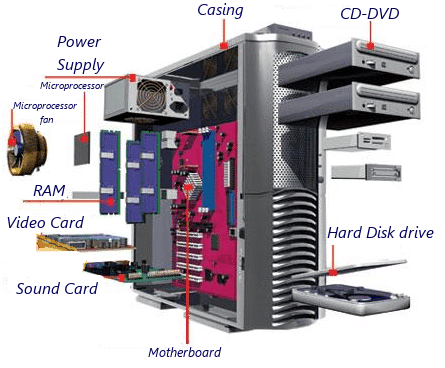 Other things to consider about your motherboard may be the number of PCI slots, the number of stock USB ports, the available monitor connections, the ability to overclock(if you insist), and the Form Factor. There are also different versions of the same series motherboard (i.e. GA-AB350M-DS3H vs. GA-AB350M-D3H vs. GA-AB350-GAMING), often different prices. It’s always worth it to do a little research before you buy; check forums and reviews if you see a mobo(motherboard) that catches your eye. RAM(Random Access Memory) is important to pay attention to; your motherboard can only handle so much. Also what kind of Ram your buying is important. Unless you’re building 10+ computers and hosting a warehouse, DDR3 is just as good as DDR4 (and less expensive)! DDR2 and below is now legacy equipment. It’s always better to get a kit with 2 or 4 sticks to double or quadruple your ram bandwidth. If you do happen to get one of these kits, your bandwidth selection means little to nothing in regards to performance of your new components. Ram just carries data that’s been processed over to the CPU and back. It doesn’t actually compute anything, it’s just short term memory. Imagine low bandwidth ram is a pipe with a diameter of, say, 3ft. We’ll also say the data is the water that flows through it to the endpoint, in this case, your processor. The higher bandwidth, the higher the diameter of the pipe, the easier it is for the data to get to the processor. It all depends on how much data you have flowing through at once, and how much data the CPU can handle. Therefore, it helps to have more than one stick; each one comes with its own bandwidth and can transfer more data than a singular ram stick. So, don’t sweat over bandwidth if you’re getting something like 2x8gb sticks with 2000mb+ of bandwidth; often times you won’t need more than what you have. For an absolute minimum amount of ram, you should check the minimum requirements of the operating system you intend to use. This is one of the cheapest of the new components. Next we’ll talk about something not so cheap. Video cards range in all shapes and sizes. Often, a certain game or program will have minimum specs for this listed on the website or directly under the download link. These specs usually give a baseline video card model, and it’s always good judgement to get a better video card than called for. Video cards are very interesting: they have their own set of ram, they often have their own cooling fans and temperature sensors, and in a lot of ways it’s like having a mini-computer attached to your computer. Computer-ception! Depending on which one you want, it could very well cost as much as the rest of your new components put together. This is where your desired performance really plays a factor in price. Just remember you can always change it out for a better one later; these are certainly an easy swap. Your power supply is one of the easiest parts to pick. Using one of the many calculators available online is what makes it so easy to figure out the Overall Wattage of your system. This little box contains all the power your system needs to boot up and function. When picking components, you also need to pay attention to something called “Rail-specific Power,” which is the measure of how much power certain components in a build draw from a power supply. Just keep in mind it’s wiser to get a power supply that handles more than what your new components require rather than one that can’t even handle your Video card alone. Thankfully, they aren’t ridiculously expensive, but the cheaper ones will run into more problems, and a warranty is a wise investment for this piece of the puzzle. This could be anything from shorting out and simply dying while you’re using your computer, to literally having a melt down, catching on fire and taking the rest of your computer with it. No pressure, though, as I said, this is one of the easiest of the new components to pick. SSDs(Solid State Drives) are mainly used for system files and are often what your operating system boots from; it’s much faster than an HDD for accessing files and will reduce your boot time to as little as 20 seconds. You can of course use one for storage, and it will access your files significantly faster than an HDD, but the price per gigabyte could be as much as $1.20. There are some that resemble ram and have their own slot to plug directly into the Motherboard, and there are some that connect via traditional SATA cables. There isn’t an advantage to either form, it’s all about how many SSDs you really need and how much space you have to work with it. HHDs(Hard Disk Drives) are mainly used for bulk storage; pictures, videos, something you don’t access quite as often, but you’d still like to keep around. They’re much cheaper, physically larger, and more liable to become damaged in the event of physical trauma. These are widely used for archiving, as they have more predicted re-writes than SSDs and are just as swappable. Your new components will appreciate either device. Next, we’ll talk about another appreciated new component: heat dissipators. Your CPU gets hot. I mean hot; like around 200 degrees Fahrenheit for the high-end ones. Often, Intel processors will come with their own coolers, but if you’re overclocking, you may consider something a little more robust. There are a couple different types of aftermarket CPU coolers for you to choose from, and they can cost from $40 to $400. Air cooling is the original method. it involves placing aluminum fins on top of the CPU chip and securing a fan on top of that so the heat dissipates more quickly. This is the first and most common option for someone that isn’t working on overclocking their machine. On the pricier side, water cooling is a little different. It attaches directly to your CPU to cool it by heat transfer, and pumps water around to a radiator which is cooled by a fan. This is more of the option for enthusiasts and those that are willing to push the limits of their CPU. There are also more extreme cases of cooling, in which all the components are completely submerged in dielectric liquid; liquid that won’t conduct electricity. These liquids can be anything from specially engineered fluids to mineral oil. This type of cooling is controversial, as lots of people argue that the liquid will eventually seep in and interrupt the communication between components. It’s important to do your own research and decide for yourself if it’s worth going this far. This is all about damage prevention to your new components, best to make the right call for your individual situation. Now comes the fun part; picking a case. You’ve already gotten through the other 7 new components, now to make sure they all have a place to live. It’s important the graphics card isn’t too tall, the power supply is nice and snug, the motherboard is secured without grounding, and the cooling system isn’t crammed in there. If you’ve read the form factors we went over in our second installment in the Build-Your-Own-PC series, you shouldn’t run into any problems. If you opted for the liquid cooling, it’s good to look at which cases are compatible with your specific new components, as well as read the reviews and personal experiences on forums and current websites. These are all the expansions; network cards, RAID arrays, USB busses, Firewire, it’s all plug-n-play. These will go in the specialized slots you have on your motherboard and stick out the back of the case. For these, you should ask yourself a series of questions. Do I have everything I need already built into my new components? Is there another service or a predisposed number of USB ports I can’t live without? Remember, these extras aren’t necessary to making the computer work, this is all extra money and fun. There you have it. No matter what you decide to do, you now know a little more about the necessary parts of computer assembly. Keep up on these articles and soon you’ll be a Computer Pro!